Greenville's favorite park and pedestrian bridge. When they opened the park it had 4 times the amount of visitors projected, showing a pent up demand which encouraged the City Council to look for ways to expand the park and add more. The City is now expanding the Reedy River Corridor North and South along the Reedy River with the cooperation of private developers, volunteers and other state agencies. The Joan Kroc YMCA Community Center is scheduled to be built just North of Reedy River Falls park along the river's corridor. The city is using this good fortune to continue a Rails to Trails project which will travel from Travelers Rest past Furman University (joining their extensive trail system) and extend south of Greenville's Falls Park to the Lake Conestee park. South Carolina's Governor's School for the ARTs. This school is for high school students that excel in music, dance, theatre & more. The students try out for positions in the school. 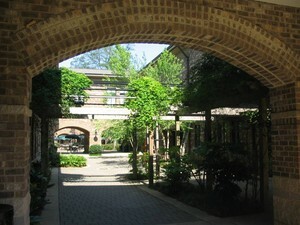 Students are admitted from all over South Carolina and live in dorms on the campus with a great view of the Reedy River Falls Park. In the summer the students are responsible for putting on the FREE Shakespear In The Park shows which showcase many of Shakespear's plays. 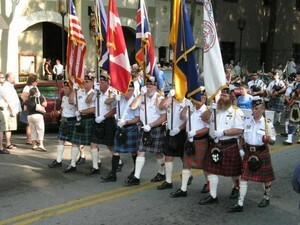 Greenville's Highland Games parade in downtown Greenville South Carolina. Every year the Highland Games just gets better and better. This year it's come to the attention of the British as well and a member of the British Royal Family actually came for an official visit. It's a HUGH honor. The first time British Royalty has visited an American Highland Games EVER. Miss America also came for a visit to the same Games. It was quit a day. This was the first year for the Highland Games to be in Greenville and everyone at the games was reported to say "It was not an inaugaral event!" It was so well run and had so many wonderful aspects to it. Currently it has gained a world wide reputation as the best Highland Games there is. This year one of the royal family came for a visit! 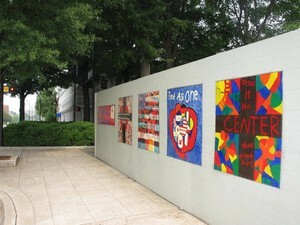 These pictures were painted by Greenville's elementary and middle school students and put on these walls. They help to make a dull wall very cheery and interesting while walking in downtown Greenville. Another interesting activity to do while walking down main is to look for the mice on main. (see the picture below) The children love it's not so easy for adults that want to find them either. These two enjoyed petting the mice! The mice are located all up and down the main street and the first one had a plak by it explaining the game. 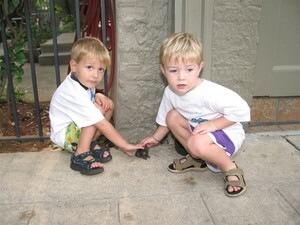 Bronze Mice on main street in Greenville South Carolina is a fun game incorporated into downtown's Main Street. Find clues to the mice's locations on the main Greenville website. 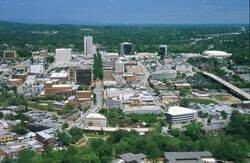 The Greenville Area has had ups and downs as a resort/travel destination over the years and as an economic force. Recent years have brought a stable mix of businesses and recreation/leisure activities. The area has always had a strong tradition in the arts and that has only grown. 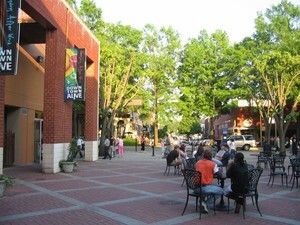 Every Thursday and Friday night in the spring/summer downtown Greenville fills up as the streets are closed and people come out to enjoy the festivities. 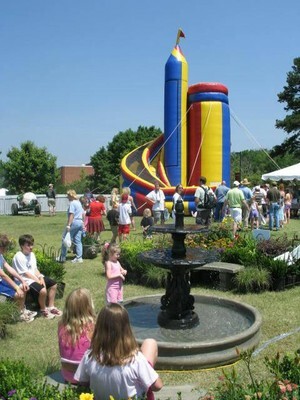 Musical jazz is offered Friday nights and Thursday night there are street vendors and inflatables for children. Roper Mountain Science Center in Greenville, SC a center for teaching teachers how to teach students. The science center is a location where teachers from all over South Carolina come to get training on teaching science courses. The center has a range of teaching facilities including a living history farm, an observatory, a planetarium, a life sciences building with computer labs, rainforest exhibit and many live animals to observe. The living history farm has live form animals as well. This center is open to the public every 2nd Saturday of the month and it's a great place to take the kids (for adults to see as well). They put on programs and have all sorts of events, displays, demonstrations and participation activities. It's quite impressive. We can only cover a small portion of the whole thing each Saturday its open. 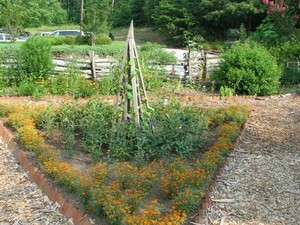 Check it out at ropermountain.org Also click on our visual tour above to see the living history farm. 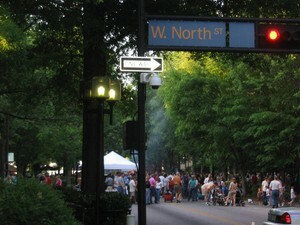 Downtown Greenville street festival. It's a normal event in Greenville to see the streets crowded with people enjoying one festival or another. From Downtown Alive to Friday Night Jazz to Fall for Greenville, Artisphere, U.S. Bicycling Championships, Highland Games and more, there is always something going on in Greenville. 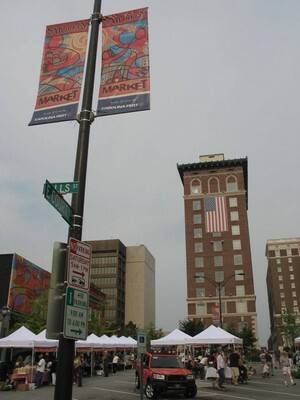 The market hosts farm goods, art items, food and music. It is great to come down on a Saturday market and after touring the market, stroll down main street and visit the French bakery (my french friends say it's very good & Real French food.) I can testify to it being very good! You can also ride the downtown trolly and have the kids sit in the fire truck while the parents visit with the firemen. In the summer a stroll to the west end where kids can run through the new fountain outside the Hampton Inn Riverplace, made just for kids to run through. Let your walk take you down to the Children's Garden, which is a delight for kids AND adults of all ages. 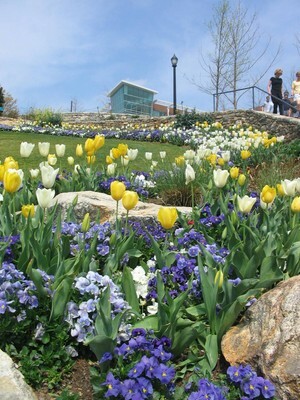 From the Children's garden A hiking, biking, running trail extends the Falls park walkway outwards towards Furman and Travellers Rest. Paris Mountain in the largest "mountain" closest to the Greenville downtown area. 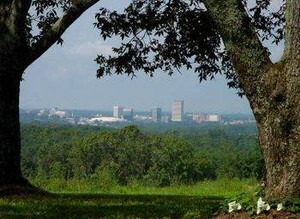 It is just a quick 10 minute drive to downtown from the view you see here. The mountain was originally named after the first permanant white inhabitant to the area, Richard Pearis. Pearis moved to the Reedy River Falls and started a trading post and grits mill. He was allowed to stay by the Cherokee who claimed this territory because he had a cherokee wife and a son, George, by her. The Cherokee deeded George 150,000 acres. George then declared British citizenship and deeded 100,000 acres to his dad. Dad got the real estate surrounding where Greenville downtown is currently and Paris Mountain. Later Richard fought in the British army against the patriots in the revclutionary war. His land was confiscated by the republic. Richard was compensated by Britain for the loss of his land and he retired to Nassau in the Bahamas with part of his family to live in relative affluence with a Royal pension.